This episode was based on the short story 'The Plymouth Express', first published as'The Mystery of the Plymouth Express' in The Sketch in 1923. The story was adapted for television by Rod Beacham and directed by Andrew Piddington. 'Plymouth Express' later formed the basis for The Mystery of the Blue Train, a novel that was adapted for Series Ten. Beacham stays largely true to the source material, with certain important additions. The adaptation opens with a visit by Rupert Carrington to Florence in her flat, and the arrival of the Count at the 'Adelphi' (the Ritz in the story). Moreover, there's a subplot involving stocks in a mining company (Yellow Creek), which interests Hastings, of course. In the adaptation, Halliday (who is Australian and called Gordon here) consults Poirot before the crime takes place. At first, he wants him to look into the issue of the Count, and Poirot and Hastings observe the couple at the Adelphi. Later, when Florence disappears on her journey with the Plymouth Express, Halliday again consults Poirot to ask him to find her. Of course, she is found murdered, and that's just about where the original story comes into the picture. There are important additions to that section too. For instance, Poirot and Hastings travel down on the train to interview the paper boy (mentioned in the story), and he remembers Florence/the culprit because she asked for the late edition of the paper, not because of a large tip. This later turns out to be a plot point, as the Count had to know whether his stock speculation in Yellow Creek had succeeded. Moreover, Miss Lemon is added to the plot, and she finds the early and late editions of all the major newspapers. Hastings gets to "interview" Rupert Carrington, whom he tracks down in a bar. Carrington is trying to escape his creditors. Also, the jewel thief (McKenzie here, Red Narky in the short story) is discovered in Miss Lemon's archive, not by Japp in the Scotland Yard files (a bit unbelievable perhaps, but a nice way to include her filing system). All in all, though, it's a nicely done adaptation with only minor changes. Even if I wish they had skipped this one, knowing that they would later get to The Mystery of the Blue Train, a very similar story. Perhaps they could have done 'The Lemesurier Inheritance' as a 50-minute episode instead? Oh, well. Piddington makes great use of the train location, there are several nice shots of the station and the train in motion (some of which I think we'll see again in a few later episodes). The production design is faultless as always. Of locations to note, there's Du Cane Court, Balham and The Adelphi Building on the Strand, London. The soundtrack is very nice, once again by Christopher Gunning. He released it on the first Poirot album, but it was removed for the re-release. Luckily, it's available on YouTube at the moment. It's nice to see the series (and Poirot) gradually explore darker territory. I admit I might be reading things into his performance, but Suchet's reaction as Halliday points out Poirot isn't a father so he can't possibly understand what it's like to worry seems to me to hint at the emotional sides of Poirot. Also, the crime itself is displayed in the most graphic way of any of the episodes, I think, both in the flashbacks and in Poirot's retelling of it. Of the guest actors, there are no real standouts. Julian Wadham (Rupert Carrington) is of course a face many will recognise these days, he seems to pop up in nearly every British television series. Alfredo Michelson is over-acting as the Count. I guess it's a difficult role to play convincingly, but still. I believe they skipped "The Submarine Plans" and "Marking Basing." Probably because the first is identical to "The Incredible Theft" and the second to "Murder in the Mews." But they made both this and Blue Train. But I don't believe they made Lemeurier - and I don't think it has such a counterpart. True, Lemesurier is the only short story not to have been adapted. Money would be the explanation to that, really. ITV didn't want to make six adaptations for the final series. But there is a tiny reference to it in the Labours adaptation; a minor character is called Lucinda Lemesurier. They didn't do The Regatta Mystery either. I know that got rewritten as a Parker Pyne story, but they did Yellow Iris, which was rewritten as Sparkling Cyanide with Colonel Race. I was kind of impressed with John Stone's portrayal of Halliday as a father devastate to lose his daughter...and yet he finds something to draw consolation from in Poirot and his handling of the case... but a cynical part of me wonders if that performance stands out because it's pretty rare in Christie that anyone actually DOES grieve the victim that sincerely. There is a passage of music that begins at the 49:19 mark which was used in the film "The Shining". I was hoping to find out who wrote/performed it, and what it's called. I noticed a lot of details on re-watching this episode. When Carrington arrives at Florence's residence, where is that interior? I noticed the wall of windows along the staircase, and they don't fit the exterior location. (Can you imagine how freezing that home would have been in the 30s, before double glazing?) The details at the trains stations also are impressive...the luggage, items being loaded/unloaded. 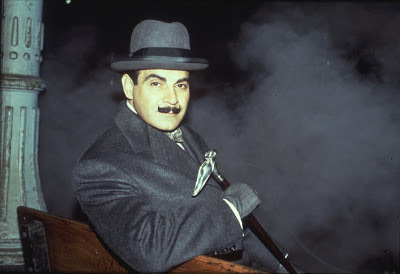 My husband says the trains are too clean/not enough soot, but I think they are beautiful, and appear in practically every single Poirot episode. There is a detail that is an error, though. The paper boy refers to "the Australian lady" but the actress didn't use an Aussie accent. I don't like the "darker" or more "graphic" takes on anything, and definitely not with Poirot. But, as usual, I can't recall just how dark and graphic this episode is. I thought the earlier episodes were rather free of that sort of thing, but I'm wrong on that. Still struggling with what to purchase to keep and rewatch forever. (Why don't the captcha images indicate what one is supposed to captcha. I've noticed this elsewhere, and usually just guess).